All over Australia, new PhD students are beginning their studies – welcome! Starting something new can be hard. Connecting with your new community can make it so much easier. Thesiswhisperer is an online community, but of course you will have your local community too, in your school or faculty. If you are new to ANU, we are running a welcome to ANU lunch on the 13th of February at University house (our very famous, nobel prize winning VC, Brian Schmidt will be giving the address this time — book early so you don’t miss out!). My sister in law, Bek, recently started a university degree relatively late in life. We are all so proud of her. Bek has done a lot already: many jobs, amazing travel experiences, raising two lovely children (hello Angus and Abi!). At 40 something, Bek isn’t really that old for a new university student. I’ve met many brave souls who embark on a PhD in their 50s and 60s. However I think anyone coming back into university after some time on the ‘outside’ faces a unique set of challenges. Becoming a student again after a long break can be confronting. You’ll be told you don’t know stuff and people will be watching your performance. At least Bek will find plenty of re-assuring structure in her undergraduate study. Not so with the PhD; suddenly you are in the driving seat. Answering Bek’s questions about university life has made me aware of some of the more … mundane problems people face coming into the university environment. Bek asked me for a shopping list of hardware and software to write with. The list got so long and complicated that I told her I would write a post instead. So this is my current advice on software, hardware and apps to do research and writing – written for Bek, but hopefully useful to others who are going back to school too. My shopping list might help you if you are upgrading, but it’s a good conversation starter too. I’d love to hear what’s on your shopping list in the comments. Although your university might supply a desktop, I think it’s advisable to have your own laptop. I have a small, light one that I can use in the library or workshops to take notes. The screen is small, so I plug it into a monitor at home or in my office when I want to write. Take your handbag to the shop with you so you can test out how it will travel. Processing power will depend on your type of research, but for basic writing you don’t need a lot. Other features matter more, such as how easy it is to back up and how smoothly the computer moves between different wifi connections. Remember to match the machine carefully to your choice of phone. Tethering your phone to your computer to get access to the internet in cafes is the best feature ever invented for a researcher on the move. You’ll want a computer and phone that play well together. Most e-readers were built for novels, which you read sequentially. When you are an academic you need to look forward and refer back in a book while being able to hold your place. This is why paper was still king for me. However, Kindle has now changed the interface to let you ‘flip’ pages and hold your place – hooray! That’s the reading app for me, but there are a few other choices, so I’d encourage you to check them out. Once you’ve decided the platform, your next question is, what do you want to hold in your hands while you read? I have (ahem) four hand held devices: two iPads (one big and one little) and a ‘fablet’ iphone as well as a conventional Kindle. Reading is important to me, and I have a steady wage now, but it’s probably overkill. If I had a limited budget I would just have a large phone that could do double duty. Annoyingly, you’ll need different software for each one. You can think of academic papers as ‘the good scissors’ – you need to keep them separate from your other tools to make sure they stay useful. Reference manager software enables you to spit out formatted references, so making bibliographies is quicker and more accurate. To store my academic papers I use Papers 3 for the Mac (for personal reasons that I outline here), but I can highly recommend Zotero as a free alternative. Zotero sits in your web browser and makes transferring information from a PDF to your academic library a snap. The random MS Word documents and PDFs that aren’t the ‘good scissors’ are an annoying challenge. In the course of any academic year, you’ll be sent a whole lot of documents, in various formats, that you will need to keep and action. I’ve played around with so many document readers over time that I have lost count. At the moment, thanks to @drwitty_knitter, I am using PDF Expert for the Mac. It has very good mark up functions – including a nice ‘red pen’ feature for editing and marking up. You can put PDF Expert on your laptop, phone and iPad and move between the same copy of a document, reducing the risk of creating multiples with different sets of notes. Suggestions for PC versions of this app in the comments are welcome. Physical handouts are best converted to digital format straight away so you don’t lose them. The easiest way to do this is to take a photo with your phone and send it to Evernote – an app that is blessedly platform independent. Evernote lets you tag the object and enrich it with other forms of information. If it’s a class handout for instance, you can record the lecturer explaining the task and attach the recording to the document (see my section on making notes below). Web pages are THE MOST ANNOYING THINGS to keep track of. There are just so many great websites, the challenge is to find a bookmarking app that is flexible enough to capture them, whatever device you happen to be using. Some time ago @drjasondowns introduced me to Pocket, which sits in your web browser tool bar or can be added to any social media app. Similarly to Evernote, Pocket is platform independent and has tools to tag and label what you have collected. At the very least Pocket gives you a ‘bucket’ to throw things in and sort it out later. There’s an art to making useful notes. Here’s some pointers to help you make useful digital objects, not just scraps of writing you never find again. I use Evernote on my iPad to take digitally enriched notes from workshops or meetings. The tablet can be used to take photos of slide decks, written notes, make recordings or and take photos of hand written notes or objects. I have an Apple Pencil to write on the iPad and I totally love it. 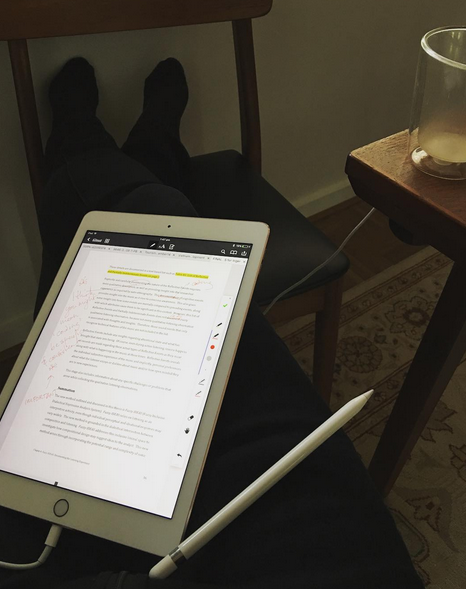 You have to have an iPad Pro It’s brought back all the fun of writing notes in a journal – here’s an example of the kind of note taking I do with the Apple Pencil and iPad, stored in Evernote. I use the various tags and filing functions to help me find them later, but sometimes I don’t bother. Most of the time I never refer to my notes, but the OCR function in Evernote is handy as it will find stuff even if the hand writing is terrible. Making notes is a way to process incoming information so that it makes sense to you. Don’t sweat if you never read them back. It is still worth taking notes because the practice ensures you read and listen properly in the first place (I wish I could convince Thesiswhisperer Jnr that this is the case!). I could go an and on about work flows with digital equipment, there is so much more to say. You can check out other posts I have done on the topic like Scrivener vs MS Word and apps to turn your phone into a research assistant. What about you? I’m looking forward to hearing how you have solved the mundane reading / writing / note taking problems in your life. Office or cafe – which is the better workplace? Are you a piler or a filer? Interesting post, thanks! As one of the ‘brave souls’ who embarked on a PhD in my 50s (and thankfully completed!) I always enjoy your thoughts. You mention the hassle of saving webpages – I use the Evernote Clipper which will save articles, webpages or URLs directly to your Evernote account – even to a specific notebook if you want. I use it with Chrome – not sure if works in other browsers. Love this post; as a Phd student who is coming to the end of it all, I personally would not have survived without my (free) referencing tool (not sure what the Thesis Whisperer policy is on naming brands?). Every time I read something that is even marginally relevant, I put it into the referencing tool – either importing it (articles import with one click) or entering the details manually (like web pages). You can search your references (like when you remember a great phrase, but not the article? Just search for the phrase in this tool and if was in a pdf, you can find it). I have no idea how people collated, collected and listed all their references in the days before referencing tools. Could you please tell us the name of it? Sounds very useful but it’s not much help if we don’t know what it is!! I would love to get back to school! Guess I am not too late for a PhD! Your article is very useful! You are never too late to learn. If it makes you feel good and you have weighed all the options and the benefits are immense, go and get your Phd. Thanks for the interesting post! Two years into my PhD, I find myself swamped with variously paper and electronic versions of many different resource types. Sorting them out – and keeping my references organized in EndNote – has been a major hassle. One tool I’ve had some success with is called Docear (http://www.docear.org/) I understand it to be a new-ish company, but the product is very helpful: In essence, it is a mind-map software that allows easy organization of ideas and (critically) _not only monitors a designated resource folder, but extracts all the comments made from the PDFs I put in there_! This makes it easy to both highlight useful quotes and take notes and make comments on them, and to get them into the right logical place in my planned writing. There are also tools that link me directly to the folder containing the original information, in case I need a bit more context, etc. Give it a go! I’d be interested in people’s perception of it! Why don’t you use the Evernote web clipper to store web pages? Great post, any advice on diagramming tools for PhDs? I have tried Omnigraffle but find it really hard to use. Omnigraffle is the best i have found/used. I find it easiest to use the hierarchical diagram templates and type in the outline that i can hit enter and tab to create a new child node instead of adding a new box and then labeling and connecting it. Once i have all the nodes roughly connected correctly, i go back and add the other connections in and am usually done before someone with visio has even gotten started. Depending on your use case, i have also used the DOT specification language that graphviz software works with because i can write a script to make the text based DOT diagram definition (say from a database table definition) and open it in omnigraffle or add it to a webpage. Hang in there with the learning curve tho…Its worth the effort! Thank you, Melanie, I will persevere. I learned to use Adobe Illustrator for my PhD diagrams. It was complex but worth it, as I can create absolutely anything rather than constraining my visuals to fit more basic programs. 1. Hazel for mac — allows automation to move, rename, process, copy, etc files. I use this to watch my downloads folder and copy any pdf file to my papers automatic import directory so they are processed and imported the next time i open papers. 2. Notability for ipad, iphone, and mac — this has been the only handwriting, notetaking, and document annotating app i have stuck with for more than a few weeks. It also records lectures and will playback the sounds while showing you where you were in your notes. This is also the only app that will backup all my notes in native format via icloud for syncing across devices and then backup to pdf on dropbox for being able to open them outside the app. 3. Dropbox pro — file backup, cloud storage, syncing, versioning, and sharing. This also makes me able to be machine agnostic so if my hardware dies i just install and let it sync, then i am ready to work. I store all files, virtual machines, installer files for software i only have older versions licensed on, and then all my settings files for applications so i dont have to reconfigure everything when i switch devices. 4. Ifttt.com (if this then that) — i have this connected to pocket and all the other services i use. This makes me able to trigger a webpage to be added to a google spreadsheet if i tag it as a reference in pocket. I can also have certain tags posted to a slack channel if there is a reason to share it with a team. Ifttt can also send an email with a specific subject line that my 2do app watches for and adds to my task list. 5. Airmail + 2do app for mac, iphone, and ipad — airmail is yet another email client but it integrates with 2do and other task management clients (trello, asana, etc) so that my to do list can live outside my email. The thing 2do does that i havent seen in other task management apps (things, omnifocus, etc), is the flexibility to organize and function like i want instead of having to be a strict GTD person. It can do those things but doesnt have to. It also has a sharing bit that i can send links from safari, slack, chrome, pocket, and most other apps to add a task to my list in one click. When it adds the task, it adds a url link back to the exact message in airmail no matter what device i am on. I could go on, but these are the main lifesaving tools that i use on a daily basis. I love hearing what works for others and tweaking my own workflow as i go. > Although your university might supply a desktop, I think it’s advisable to have your own laptop. I have a small, light one that I can use in the library or workshops to take notes. minor quibble here – I wouldn’t get too hung-up on lightness and don’t buy consumer windows laptop. I currently use an thinkpad X260 (now replaced by the x270) and besides being unkillable, have a great onsite four year warranty for buttons. Also with the brightness down, a near twenty hour battery life. Even more importantly, if you are cranking out content, a fantastic keyboard. Also in regards to word – if you aren’t doing anything complex in terms of formating – I’d use google docs and pay for what I consider the best reference manager paperpile. Also if you can stretch to it – two monitors FTW in your home office set-up. Reference manager software is essential. EndNote is radically overpriced and behind in terms of features, but unfortunately is standard in certain fields. There are open source alternatives (Zotero). I use Bibdesk, which is only about $50. Devonthink (much more complex and correspondingly harder to learn, but also more powerful. For example, you can link to specific locations inside documents). Both of these allow you to store ALL kinds of documents and to easily display, search, reorganize, and annotate them while still in the main application. For web pages, you have the option of storing as HTML, or converting to PDF. A third option, which went through years of bugs but is apparently now OK, is Papers (papersapp.com). But it only has native support for PDF – everything else has to be stored as PDF. Still, if I were starting over I would give it a serious look. Finally, Bibdesk or other reference managers may be OK for managing documents, although I’ve never tried it. Scrivener and its ilk you have discussed elsewhere. I’m trying to decide what to use as I start my PhD and now I’m confused after reading the post above regarding a reference (citation) and document manager being two separate things. My understanding is that Mendeley is both a reference (citation) and document manager all in one? Is that right? Can someone who uses it please comment and let me know. I”m seconding this request. I too have become unclear reading through the wonderful contributions. Could someone please simplify? I’m a late 50’s heading into PhD. Need clear direction right now, thanks all!! Would you mind please identifying the app shown on your iPad pro in the photo?! What i don’t understood is in truth how you are no longer actually much more neatly-favored than you might be right now. You are very intelligent. You recognize thus considerably on the subject of this matter, produced me for my part believe it from so many numerous angles. Its like men and women aren’t involved until it is one thing to do with Girl gaga! Your individual stuffs nice. Always care for it up! Now a days it has become more convenient as well as more complex to go back to school in this age, specially the documents.